Buildings are coming down all around town at a frenzied pace as old makes way for new. But what happens to the wood, concrete, metal, glass and other materials that come down with the structure? The sun has barely burned the fog off Lake Washington as Noel Stout, standing near the water’s edge, peers at a heavy wooden trellis suspended 20 feet above a concrete backyard patio. He’s rigged a system of ropes and pulleys to the cedar latticework, which just yesterday supported a deck with a sweeping view across the lake from this sprawling Laurelhurst home. If all goes according to plan, the structure will crumple at its base and collapse in the yard away from the house. If not, it’ll crash through the large picture windows, disturbing the tranquil morning. The homeowners decided to replace the rarely used deck with a simple roof to shade their patio. The contractor hired to do the job recognized the value in the existing lumber and enlisted Stout for the demolition. Over the past couple of days, he’s been severing the trellis from the house and contemplating how to bring it down safely. Standing ready in a baseball cap and a bright green T-shirt, he gives the rope a pull, and the wood begins to lean. He digs in his boot heels and tugs. A striking crack, and the whole thing crashes to the ground. The house is intact, and, most importantly, so are the 12-by-8-inch cedar beams Stout was after. Yielding just over 9 tons of salvageable lumber, this is a small job for Dedicated Deconstruction, a company Stout, 41, founded in 2011. As often as possible, he and his crew dismantle entire houses, though they also strip material from other types of residential and commercial buildings. Each year, they divert about 20,000 tons of material that would otherwise end up in a landfill. They’re the only game in town devoted entirely to deconstructing residential buildings for reusable material, and these days there’s more than enough work. In a brief break between hauling, Stout notes that things haven’t been this busy since before the Great Recession, when he worked for Ballard Reuse. In 2010, the City of Seattle issued 236 demolition permits for everything from a home remodel to a complete building demolition. By 2016, that number had risen to 646 permits. Debris generated by those demolitions increased by more than 50 percent, amounting to 532,000 tons. Construction waste accounts for one-third of the city’s landfill totals. As Seattle grows at a breakneck pace, so does its scrap pile—and its environmental impact. Our city’s fervor for continual renewal is fully visible in the constant demolition and construction around South Lake Union and on small lots throughout the city. Less obvious is the environmental impact of the building and construction process, which begins when a material is harvested, then deepens as the raw material is processed, distributed, used in construction and sometimes refurbished, until it is quietly carted to landfills in southern Washington and Oregon. Each material carries its own history and impact, some longer and more profound than others. Timber, managed as a crop on public land by the U.S. Department of Agriculture, is about as local and renewable as it gets. Metals, though recyclable, are energy intensive to forge. Plastics are an environmental hazard at every stage, made from crude oil pulled from beneath the Gulf of Mexico or the tundra of Arctic Alaska or the sands of Saudi Arabia. When the cost of oil is high, producers tend to use recycled plastic; when a barrel’s price is low (as it is now), it’s often cheaper to use virgin crude. Even something as seemingly benign as the smooth river rock found in many of our yards can be traced to dredging operations as near as British Columbia or as far as South America. “Are we ignoring a major environmental impact with all of this construction?” asks Kate Simonen, an associate professor of the University of Washington’s College of Built Environments. “The answer is definitively yes.” As powering and heating buildings become more efficient, she explains, a structure’s materials can account for more than half of its total environmental impact over its lifespan. But reusing existing materials can drastically reduce that impact, she says. “You’d be hard-pressed to see someone throw away a truckload of gas, but they’ll throw away a truckload of gas’s worth of material without thinking twice,” Stout says, referring to the energy each piece of material embodies over its life. The dark-haired, bearded Stout lives with his fiancée on a foot ferry he’s ever renovating in Shilshole Bay Marina. More pragmatist than activist, he holds a degree in environmental education and worked as a bike, kayak and naturalist guide before a job in a salvage retail store brought him face to face with the mounting environmental impact of construction waste. By deconstructing buildings by hand—sorting out the lumber, doors, windows, lighting fixtures, countertops, bricks and myriad other items that still hold value—and distributing those pieces directly to salvage retailers like Second Use and Ballard Reuse, he extends the lifespan of materials. It’s his way of pushing back against the growing human footprint. His company’s mantra is “Starve the landfill, feed the future.” The construction industry as a whole is not always as enthusiastic. Overall, the amount of material that ends up in a landfill is growing. Ramped-up construction has simply resulted in more waste, says Kinley Deller, project manager for King County’s Solid Waste Division, and local officials have struggled with how best to incentivize builders and contractors in a way that will encourage reductions. So far, the City of Seattle and King County have primarily focused on recycling. Material waste is divided into what can be recycled, what can be sold to various end markets and what must be loaded onto a train bound for the dump. Seattle Public Utilities aims to recycle 70 percent of construction debris by 2020 (it’s averaged 60 percent over the past decade). Some materials, such as wood scrap, which can be sold as fuel to power Tacoma’s paper mills, also offer an economic incentive to divert waste. To encourage recycling and salvage, the county puts a price on every ton of material taken to a landfill. However, rising fees, new bans on what can be disposed of and awareness of the problem waste poses among contractors have been only partially effective. Scheduling for deconstruction is a significant barrier, says Gabriella Uhlar-Heffner, who oversees construction and demolition waste programs for Seattle Public Utilities. For contractors who must line up permits and work crews, organizing time for deconstruction can be difficult. As a reward for those who opt to deconstruct a building slated for demolition, the city has attempted to streamline the otherwise languid construction permitting process. So far, however, piling on dump fees has been a more successful deterrent to waste. Seattle does require that anyone who wants to demolish or remodel any space greater than 750 square feet submit an assessment of the amount of salvageable material in a structure, says Uhlar-Heffner. Yet there is no requirement that they follow through with salvaging it. Even with no mandatory salvage requirement, Stout has plenty of work. He is usually referred to jobs by environmentally-conscious contractors who know good materials when they see them. Instead of profiting from the sale of the materials directly, Stout is paid by the contractor for the demolition work. 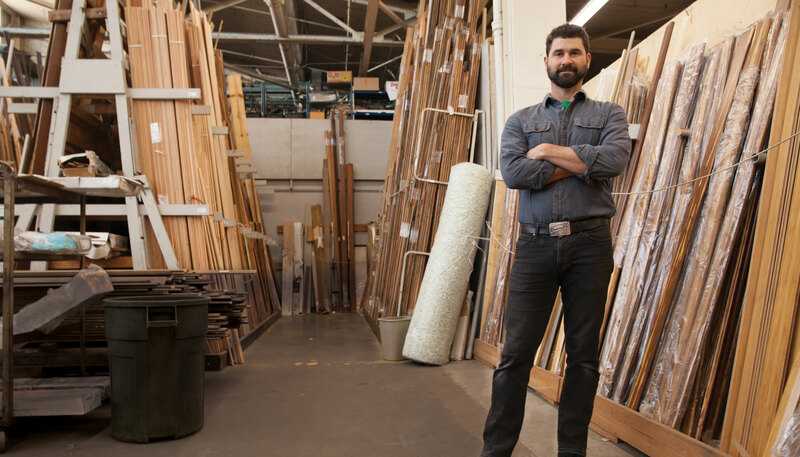 He then donates the salvaged material on behalf of the homeowner to local retailers for a tax-deductible donation that often covers the added cost of deconstruction by hand. In April 2017, a Sammamish family decided to replace their 3,510-square-foot timber frame home and opted for a full deconstruction. For six weeks, Stout’s crew of six stripped the house of its floors and fixtures, and carefully pulled the wooden pegs from the sturdy fir beams so they could be resold as a complete kit. While salvage and recycling have given him a good business, Stout laments a culture of planned obsolescence that prioritizes the cheapest, fastest option. Old buildings, like those included in Portland’s ordinance, often present enormous salvage potential. New structures, however, typically made of young timber slapped together with glue and nails, are rarely built with the idea that they might one day be cannibalized for new construction. The bones of old structures, however, are scattered throughout Seattle. In 2008, an entire house was salvaged, in a sense, when it was picked up and moved 10 blocks to a new site on Evanston Avenue in Fremont. The tables in Ballard’s Pestle Rock restaurant are crafted from slabs of bowling lane taken from a now forgotten neighborhood bowling alley. Just down the road from the restaurant used to be the BalMar; years ago, Stout walked into that bar, looked up, and gasped at a chandelier he vividly remembered pulling from a DoubleTree Hotel in SeaTac. “It was a nightmare to get out, and the thing was super ugly,” he recalls. Nevertheless, someone bought it, repurposed it and hung it in Ballard. On a recent night, he dropped by to point it out, but like so much of Seattle these days, it wasn’t there. The space changed hands again last year, and the new owner had done away with it, another casualty of the material world.